They were reincarnating at this time to help humanity through the transition that was imminent. During the time that Atlantis was breaking up, they had taken on this task of bringing in a New World by choosing to reincarnate in the present time. I was to write a book explaining the true history of the soul on Earth to provide them and humanity with a better understanding of life in preparation for this New World. I saw a fountain. It was both golden and turquoise. “It’s Aquarius!” I said, and then I understood that the young people were the harbingers of the Age of Aquarius, of which we have heard so much that it has almost become banal. Nonetheless, although “New Age” and “Age of Aquarius” have become so commonplace as to be advertising slogans, they are phrases that actually have great significance for our times. However, I did not see the Aquarius astrological symbol as it is usually depicted: two wavy lines, portraying water, because Aquarius is the sign of the water-bearer. Instead, I saw water gushing upward like a fountain out of what appeared to be a golden pyramid. It was a lovely symbol, and I liked it much better than the double-wavy lines as an emblem of an age which is supposed to be characterized by harmony and peace. I saw the young people rise from their knees and begin to glow. They turned to the right to a place that floated and that seemed to have the three Great Pyramids on it. What was that about? The next race being born? I had a distant recollection of reading or hearing something about root races from the 19th century mystic, Madame Blavatsky. I was also vaguely aware that there was something in the Cayce readings on a Fifth Root Race soon to be born. Was the Fifth Root Race the new race referred to in my vision? If it was, why was I involved in it? My conscious mind began to panic at the thought of writing a book about something so unusual. “I have fears about results—whether I’ll be successful or whether people will laugh at me,” I said to Lynn while hypnotized. I felt totally inadequate to the task. It was one thing to be curious about reincarnation and to have dreamt about the man I would marry. But to write or speak about something as strange as a new type of being? I couldn’t do that. People would label me a flake, John might leave me, my children could lose respect for me. What would my parents think? As my fears mounted, I realized that there was someone standing beside me. “Have no fear, I am with you,” I heard. It was the same voice I had heard in church. I saw sandaled feet and the bottom of a white robe. Suddenly I saw myself as a flower. Instead of being a human being sitting in the recliner in Lynn’s office, I was a white lotus. “It unfolds, and it has golden stamens that reach up,” I said. The main thing I know about the lotus is that the Buddha is typically depicted sitting on a lotus. It is also associated with the water lily, a plant that rises out of murky waters to produce a beautiful flower. Amazingly, the image of myself as a lotus was very comforting. It was as if it said that I could rise out of my own murk to produce something beautiful. 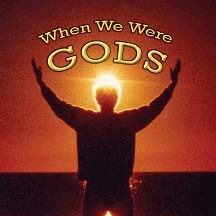 Find out more about When We Were Gods: Insights on Atlantis, Past Lives, Angelic Beings of Light and Spiritual Awakening.